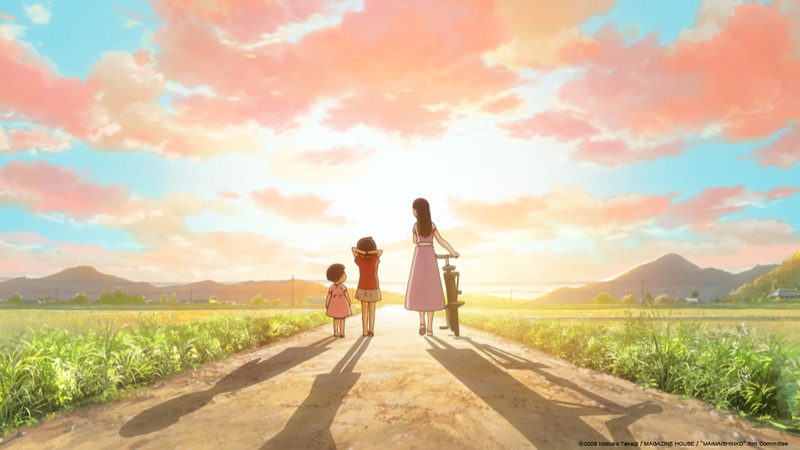 Mai Mai Miracle may be set in 1955, but it’s about the endless now of childhood: summer days that last forever, liminal worlds of the imagination. For the kids in the film, a wheat field is the sea; all caves hide monsters; fish are magic and the coolest friends are the ones in your head. Nine-year-old Shinko is a merry country girl intrigued by a new transfer pupil at her school, a sad-faced girl called Kiiko. For Shinko, Kiiko seems from another world. She wears perfume, she has coloured pencils, and her house has stairs. Nonetheless, the girls become fast friends, with other kids collecting around them as they seek adventure in the countryside. Mai Mai Miracle is also about the distant past. The film’s lovely trick is to show how a child’s imagination intersects with history, finds kinship with it, and brings it to glorious life. Shinko is fascinated by the traces of a town that bestrode her region a millennium ago, and envisions a lonely little princess, yearning for a friend of her own. The princess weaves in and out of the film, which also shows the 1955 kids trying to comprehend the future: adulthood. Grown-ups are so confusing, first seeming to be one way, then another. The kids sneak into the cinema and watch a romantic film: do adults really kiss like that? But while the children are too young for romance, they know all about love. One of Mai Mai Miracle’s core themes is the impact one person can have on another, be it a playmate, a parent, a teacher, or even a thousand-year-old royal. Most obviously, Kiiko is profoundly changed by her friendship with Shinko, taught new ways to think and imagine and feel, as Shinko was taught in turn by her beloved grandpa (who is, fittingly, a former teacher). It’s also a film about empathy, about children realising grown-ups were once young like them, or a character looking in a mirror and seeing another girl’s face. Mai Mai Miracle is also a film about mortality. The youngsters aren’t insulated from the real world, with references to several deaths, though none are shown directly (and they shouldn’t distress child viewers). 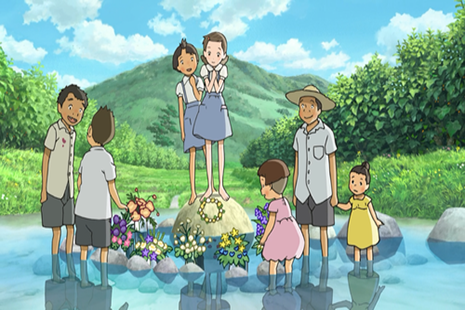 Kiiko is grieving at the recent loss of her mother, and this is shown with great delicacy – and with the miracle, especially suited to animation, of tears turning inside out into laughter. The scene in question, where the girls innocently consume alcoholic chocolates, is laugh-aloud funny – at a London Barbican screening, it brought the house down – and cathartic, as Kiiko unburdens herself. As well as death, the children explore permanence: the trees and landmarks that last for centuries, the invisible people always here, in the centuries before and after. Mai Mai Miracle stands in multiple traditions, Japanese and universal. As a Japanese cartoon, it connects to other anime classics about childhood, from Heidi (a beloved TV anime version of the Swiss book glimpsed in Kiiko’s room) to My Neighbour Totoro. Director Sunao Katabuchi cites such live-action films about childhood as America’s Stand by Me, Britain’s Hope and Glory and Spain’s The Spirit of the Beehive. Like them, Mai Mai Miracle is removed from today’s kids by decades of changing culture and media. And yet, it’s not so removed. If Shinko, and later Kiiko, can leap back imaginatively a thousand years, then what’s five or six decades? Of course, the film is also aimed at adults for whom that’s not a long time at all. The 1955 setting lets the director fill the screen with fond nostalgic elements. Some are specifically Japanese, like a kamishibai travelling storyteller, but many will also click with foreigners: steam trains, horses and carts, pre-TV children sitting transfixed by the radio. Other things in the film are much rarer in 2016 than they were sixty years ago, like boys and girls getting spontaneously together, without adult supervision, to dam up a stream. Like many celebrations of the past, Mai Mai Miracle seems addressed to the present, to our push-button, screen-saturated age. It asks, simply, if there’s perhaps a better way for people to live, and especially for children. 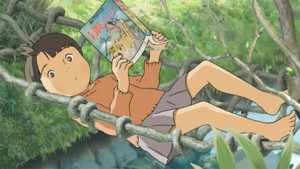 Very early in the film, we see Shinko in the grass, happily surrounded by the bustling ancient town of her imagination. It’s a real virtual reality, and a real act of animation, using only the mind’s eye. Mai Mai Miracle will be released on Blu-ray/DVD by Anime Limited.